The sleep business has woken up. According to BCC Research analyst Natana Raj, Americans shelled out more than $43 billion on sleep aids and sleep tech in 2016, and that number is on the rise. But with all the gadgets on the market, which one deserves a spot on your nightstand or under your pillow? Can high-tech gadgets help Americans get better sleep? If you want to track your sleep, but don't like the idea of wearable device like a Fitbit, then the ResMed S+ is a great option. Once you aim the tall rectangular device towards yourself, it tracks breathing and body movements to analyze how well you're sleeping. With its companion app, it then offers a "sleep score," graph showing when it thinks you were in deep, light, and REM sleep. The tracking technology is based on ten years of research by the ResMed team, and, after our testing, it seems to have mostly paid off. It did a good job figuring out when we were in bed, and the sleep analysis seemed to reflect how rejuvenating (or not) sleep felt. The app tries to offer feedback, too, though some of it is common sense - like taking a bath to relax before sleep and getting more exercise. The device is reliant on the app and Bluetooth connectivity to your phone, and in our testing, it became unpaired after a few nights. It was easy to pair it again, but having to troubleshoot Bluetooth before bed isn't exactly relaxing. It also monitors the conditions in your bedroom - like temperature, light, and noise level - in case those factors could be keeping you from your ideal sleep. The company notes that ResMed technology will soon be integrated in a new sleep tracker from SleepScore Labs, so keep an eye out for that later this summer if you can wait. Also vyiing for space on your nightstand, BEDDI Glow from WITTI is an alarm clock that can wake you up naturally with a simulated sunrise. The light is customizable in any color you could possibly want, and can gradually increase its glow for up to 30 minutes before your alarm time. You can download their companion app and pair your BEDDI Glow alarm with music from your smartphone, the radio, or services like Apple Music and Spotify. It's an attractive bedside companion with thoughtful additions like traffic and weather updates at the press of a button - though just with a computerized voice that's reliant on your smartphone. As smart alarm clocks go, BEDDI Glow is a good choice for a much gentler and more customizable wake-up than the blaring of an alarm from a smartphone. If you or the person who shares your bed is a snorer, think of the Smart Nora as the improved, high-tech version of prodding them to get them to switch positions. The device has two parts: an electronic sensor that looks like a white computer mouse that sits on your nightstand, aimed in your direction, and an inflating pillow insert attached to a fabric case. When the sensor "hears" snoring, the sleeve under the pillow inflates. The idea is that the movement of the pillow will stimulate the relaxed throat muscles that cause the snoring and then allow for natural breathing to resume. In testing, the Smart Nora did seem to decrease the frequency and volume in our house's snorer - making for a more restful night for everyone. We found the device's 30 minute delay option particularly useful, because if not engaged, Smart Nora would interpret pillow talk as snoring and start the inflating and deflating. And a rising and falling pillow is not exactly a mood setter before bedtime. Plus, while Smart Nora is described as "silent," we could amost always hear a gentle inflating noise (when we were awake). Aesthetically speaking, some might be bothered by the plastic tube that extends from beneath the pillow since it does give the Smart Nora the look of a medical device (which it is not). You can hide the device's boxy kit under the bed, but there's no easy way to disguise the tube. This pillow is really trying to do it all, which is probably at least part of the reason why it costs so much (for a pillow). 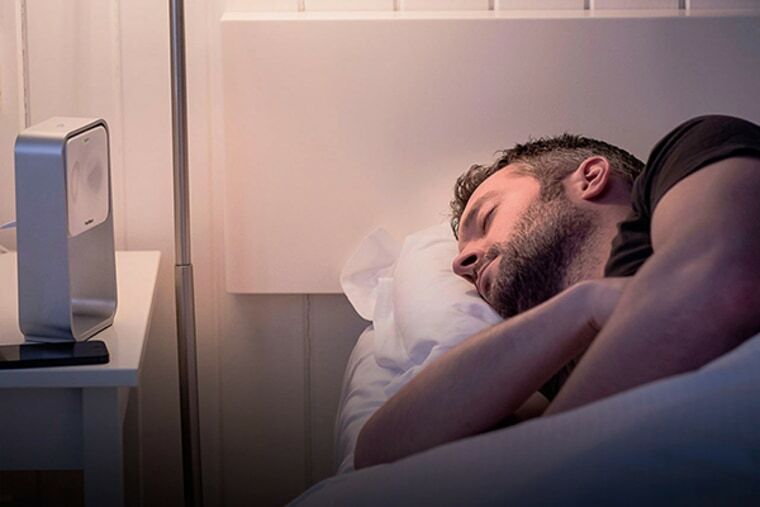 One of its most attractive features of the Zeeq Smart Pillow is its ability to play sound that's audible only to the person whose head is resting on the pillow, not his or her bed companion. This could be great for a couple where one partner likes to fall asleep to music or an audio book, but the other needs silence. In testing, it delivers on this ability for music or for an alarm. Despite the fact that the pillow has multiple speakers, a gyroscope, a battery and a microphone inside it, it's comfortable thanks to being filled with (purple!) pieces of memory foam. Zeeq also promises to stop snoring with its embedded microphone and two vibrating motors that buzz when snoring is detected. We found the inflation of the Smart Nora more gentle than the buzz of the pillow, but this inevitably varies by the individual. Like the S+ sleep tracker from ResMed, Zeeq also has a companion app and is marketed as a sleep tracker. But, the tracker relies on motion detection by the pillow, unless you spend more on a sleep monitoring strap that collects heart rate and respiratory rate information. With any device promising to give detailed information about how well you are sleeping, most sleep experts say not to hang your hat on the sleep scores they offer. "If one's using it hoping to find, 'Oh, I'm getting this much deep sleep versus REM sleep,' there they're not quite as accurate," said Dr. Shelly Zak of the Sleep Disorders Center at the University of California at San Francisco. "Use them as sort of a general guide, but not as a specific measure," she advised. Under Armour is getting in on the sleep game, too, by printing what they call bioceramics on the inside of the fabric of their garments. According to the company, this fabric can absorb body heat and reflect it back as far-infrared energy. The company points to studies from the National Institute of Health that show positive impacts of far-infrared energy on recovery - things like helping your body restore muscles while you rest. In testing, the pajamas were very comfortable, but it's hard to really put a finger on whether we felt particularly restored (or any different at all) when we woke up. According to Dr. Zak, further study would be needed to really prove that pajamas can actually improve sleep quality. "It's intriguing," said Zak. "But they would need larger studies and more controlled studies to really make an assessment of whether or not it's efficacious," she said. Of course, there are plenty of free options for improving your sleep — no gizmos required. Doctors say basic changes like minimizing noises from your sleep environment (especially those you might not think of, like an air conditioner clicking on in the middle of the night and waking you up) can make a huge difference. And, try to stick to a regular sleep schedule and spend a minimum of an hour relaxing or "winding down" before bed.